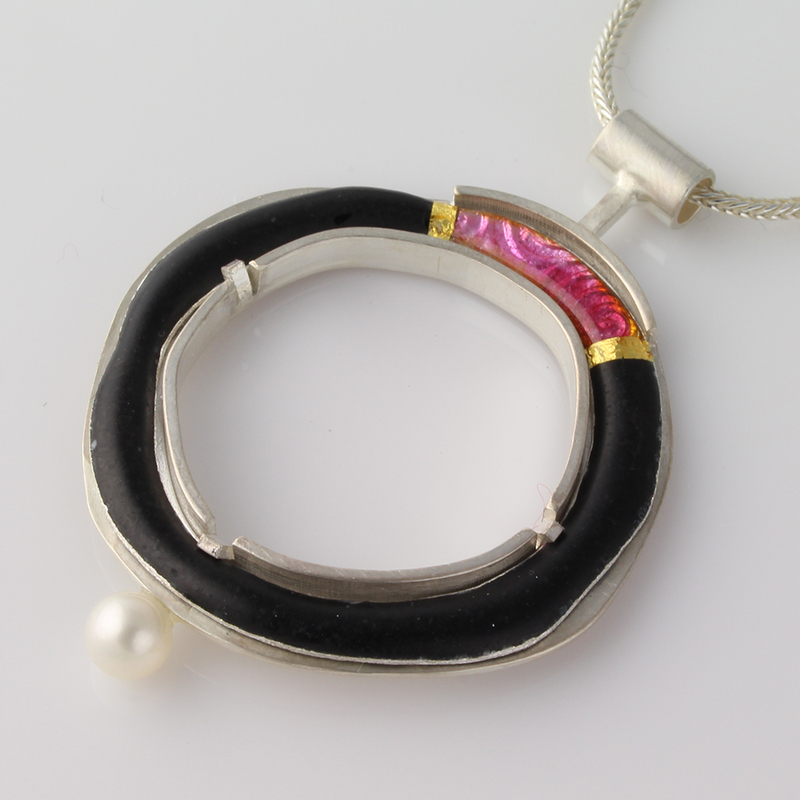 Black matte (etched) enamel contrasts with glossy transparent pink enamel. Etching your enamel will give it a silky, matte finish. 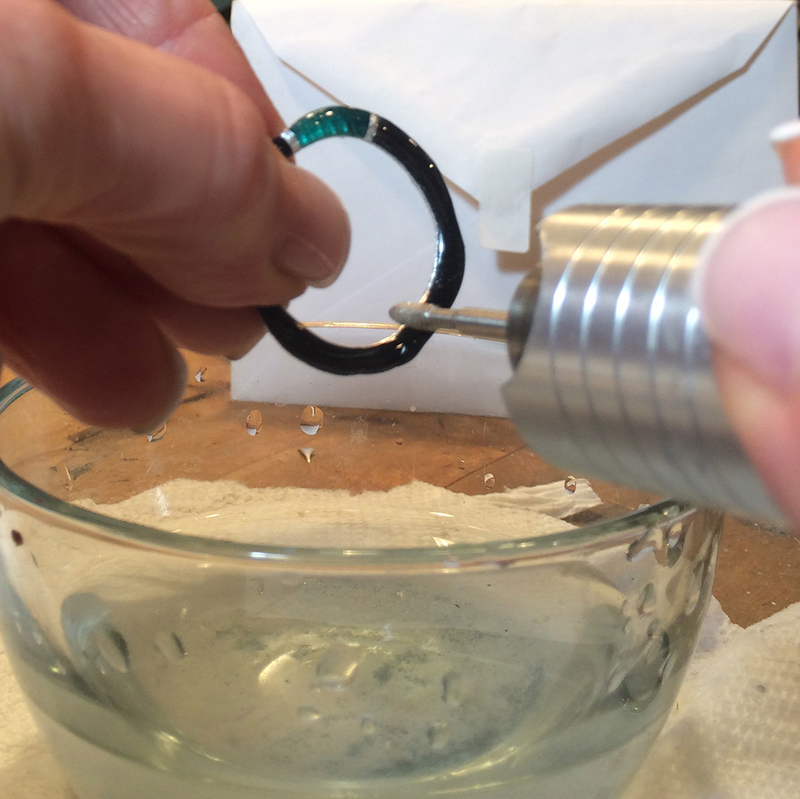 Add more visual interest by spot etching, or only etching certain parts of the enamel. For instance, in these photos, I have etched only the opaque black enamel, leaving the transparent pink enamel glossy. 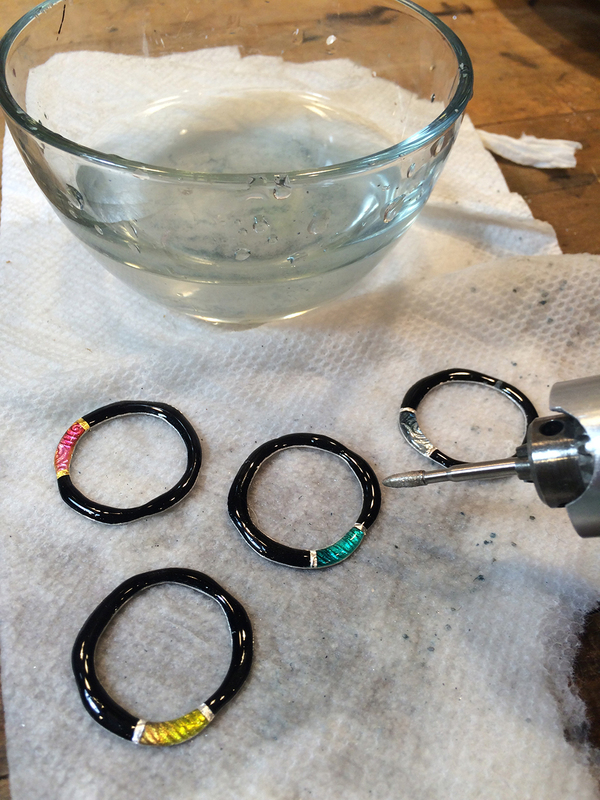 First, I use a diamond bit to grind off any pieces of enamel that are sticking out. Always grind enamel with water to avoid cracking off chunks of enamel. 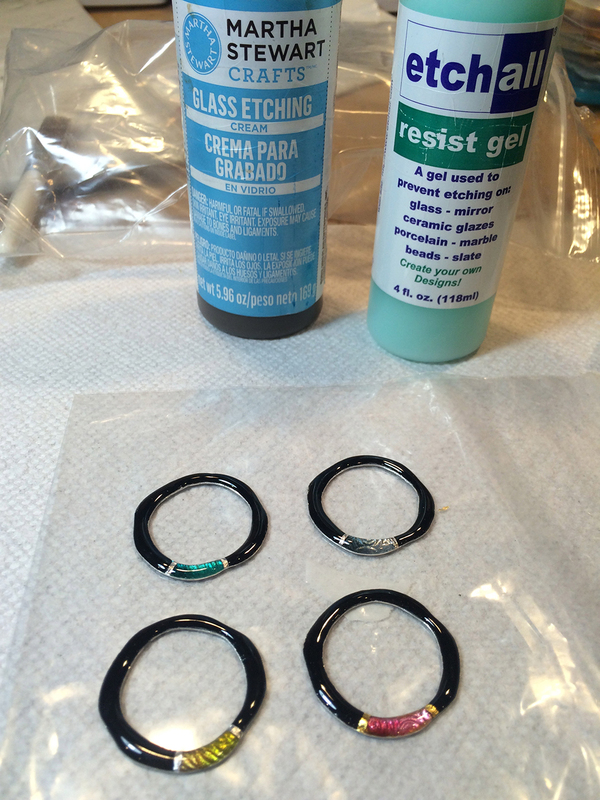 I used Etchall brand etching resist gel, which I carefully applied with a small brush. 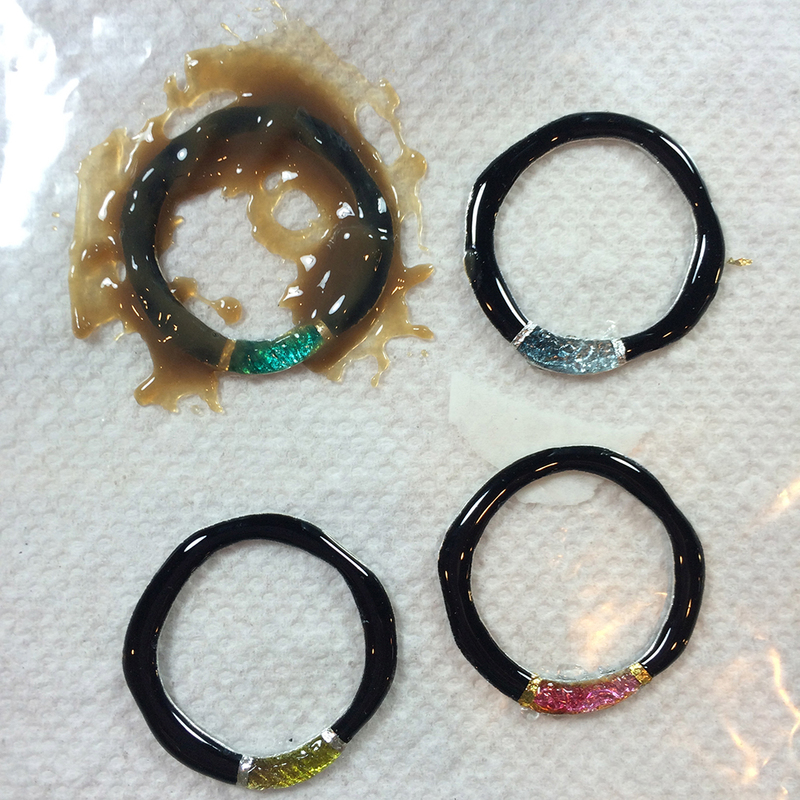 It goes on milky and dries to a clear plastic in about 10 minutes. Then I generously applied the etching cream to the black portions of the piece. This time I used Martha Stewart brand etching cream, but I have also used the Etchall brand successfully. I waited the required 15 minutes for the etch to work and washed the entire piece in water. I used a tweezer to remove any remaining gel resist on the piece; an easy process because it usually comes off as a whole. I love the contrast of the matte opaque black against the glossy transparent enamel! Grinding with a diamond bit. Grinding done after dipping in water. Martha Stewart and Etchall brands. Etching cream is applied over dried etching resist gel. Posted in Enameling and tagged enamel etch resist, enamel pendant, enameling, etching enamel, flex shaft tool. Bookmark the permalink.